This is sweet from the honey, but retains a nice bitter edge. It’s simple and delicious. And it’s really fast to make. 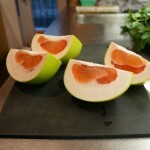 Pomelos usually show up in the market at the height of winter. 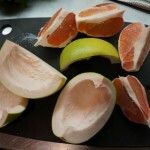 They look like really big grapefruit, sometimes having a slight pear-like shape. Skins range from yellow to yellow-green. 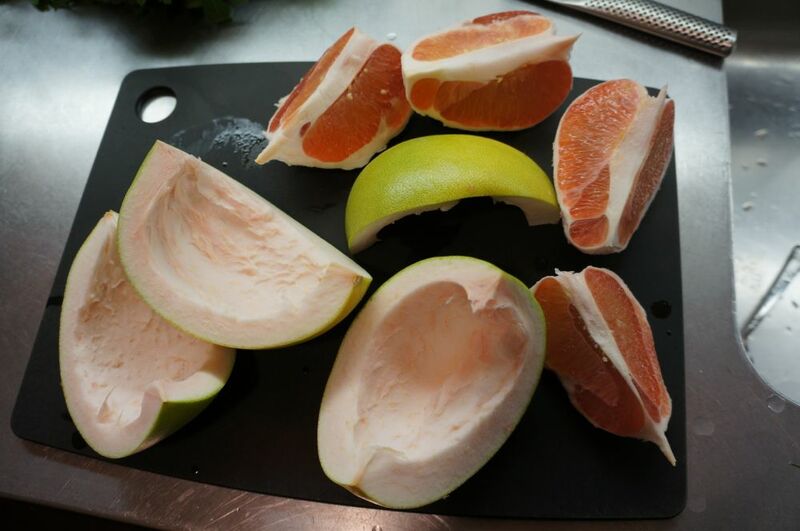 Find a pomelo that has no blemishes on the skin. Cut the fruit into quarters, through the stem end. For each quarter, make a small cut between the fruit and the pith nearest one end, and then running your thumbnail around the fruit, separate the peel and fruit. You should be able to remove the peel on each quarter in a single piece. Reserve the fruit for eating. 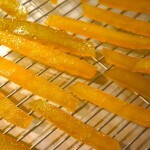 Cut the peel into strips about 5/8 of an inch wide, but the size and shape is up to you. Turn each strip on its side and trim the pith down so the thickness of the peel is about 3/8-inch. Put the peels into a pot full of water. Bring it to a strong boil, let it boil for one minute and drain off all the water. Add cold water and in under a minute the peels should be cool enough for you to squeeze out the water without burning yourself. 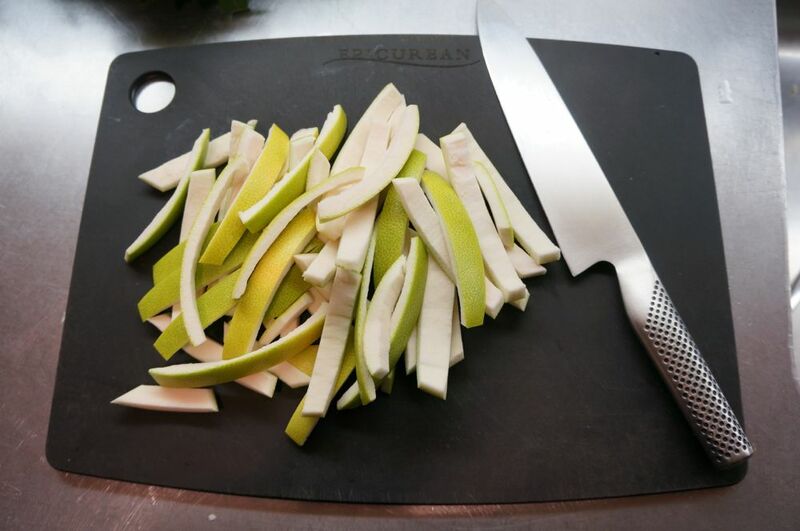 &diamondsuit;ATTN Repeat the process of boiling, draining and squeezing the peel three more times. Each time you do this it removes some of the bitterness, so you can adjust the bitterness to your taste according to how many times you boil the peel. If you really like a bitter flavor, only boil it a total of three times, not four. Set up a cake rack and place a sheet of wax paper or foil underneath it. 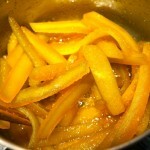 After the last boiling, put the drained peel back in the pot with 1 to 1–1/4 cups of honey. (You don’t have to measure it precisely because if it’s too dry you can add more and if there’s a little extra it will boil down or drain off.) 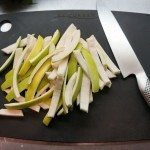 Bring to a simmer and move the peel pieces around with tongs or chopsticks. The honey level may seem low, but you will need to get all the sides of the peel covered, so turn them as necessary. Add a little more honey as it cooks down, if needed. When the honey is disappearing and &diamondsuit;ATTN the peel is translucent, transfer the pieces to the rack. Make sure the pieces aren’t touching. I find some pieces are done faster (they become translucent as they absorb the honey) and I remove them and let the rest keep cooking.